Bangle sizing focuses on the hand size rather than the wrist size, the bangle does not open therefore it must fit over the wearer’s hand. 1. Lay your hand comfortably on a flat surface (do not spread fingers too wide). Be sure to measure the hand on which you intend to wear the bangle. 2. 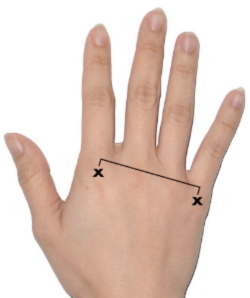 With a ruler, measure the distance from the centre of the first knuckle (index finger) and the centre of the fourth knuckle (pinky finger).